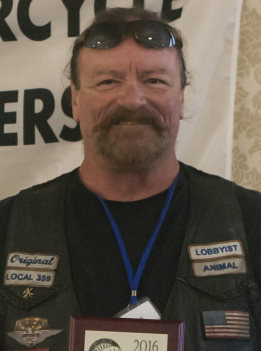 On Sept 23, 2016 I introduced myself as the Arizona State Representative for the Motorcycle Riders Foundation in Washington, D.C. at the 32nd annual Meeting of the Minds Conference in Oklahoma City. I would like to thank the 4 state motorcycle riders organizations of Arizona, the Arizona Confederation of Motorcycle Clubs, M.M.A, A.B.A.T.E and M.M.A.A for their endorsements and support regarding this position. I would like to thank the 4 state motorcycle riders organizations of Arizona, the Arizona Confederation of Motorcycle Clubs, M.M.A, A.B.A.T.E and M.M.A.A for their endorsements and support regarding this position. For general info the MRF watches our state and federal lawmakers for motorcycle issues and Bill’s looking to be passed in House or Senate. I’m proud to be a part of this team, would you like to become a member? The M.R.F. Conference was hosted by A.B.A.T.E. of Oklahoma and held at the Tower Hotel. Our hosts and the hotel did an excellent job of making us welcome, including rides to and from the airport. The M.R.F. 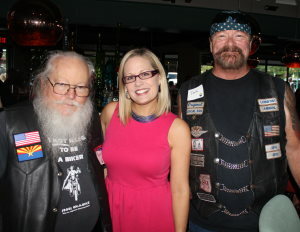 Political Action Committee has awarded our two Arizona Congresswomen KYRSTEN SINEMA and ANN KIRKPATRICK letters of thanks for their support of the motorcycle community along with campaign contributions and wish them luck in the upcoming election. Our team was myself, Jim Butsback, Mary Kay, Bobbie Hartman, Skypilot, Buddha, Dragonfly and Gynni and we had to split up to cover all the agenda items. Support a national Anti-profiling bill for all riders, protect and defend your rights. Independent and club riders rights are the same.